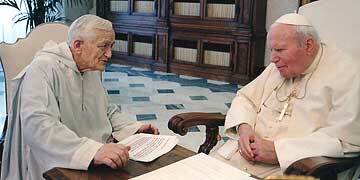 Brother Roger met Karol Wojtyla, the future Pope John Paul II, in 1962, during the Vatican Council, when he was still the young auxiliary Bishop of Krakow. As Archbishop of Krakow, Mgr Wojtyla visited Taizé twice, in 1964 and 1968. After he became pope in 1978, he received Brother Roger every year in private audience. He welcomed in Rome the thousands of young adults of three of the end-of the-year European meetings. During one of his journeys, the Pope visited Taizé in 1986. Pope John Paul II decided to make a stop in Taizé during his trip to France. The pope has been in Lyon since the previous day, and will also go to Paray-le-Monial, Ars and Annecy. Large tents have been attached to the Church of Reconciliation. Seven thousand young people have arrived. Throughout the night, some of them take turns praying in silence until the following morning. At 8:30am, after having sung with the young people, the brothers leave the church to welcome the pope. The entire region is shrouded in a dense fog. The helicopters could not leave their hangars and so the pope has to come from Lyon in an ordinary car. “(…) Like you, pilgrims and friends of the community, the pope is only passing through. But one passes through Taizé as one passes close to a spring of water. The traveller stops, quenches his thirst and continues on his way. The brothers of the community, you know, do not want to keep you. They want, in prayer and silence, to enable you to drink the living water promised by Christ, to know his joy, to discern his presence, to respond to his call, then to set out again to witness to his love and to serve your brothers and sisters in your parishes, your schools, your universities, and in all your places of work. Today in all the Churches and Christian communities, and even among the highest political leaders in the world, the Taizé Community is known for the trust always full of hope that it places in the young. It is above all because I share this trust and this hope that I have come here this morning. Dear young people, to bring to the world the joyful news of the Gospel, the Church needs your enthusiasm and your generosity. You know, it can happen that your elders, after the difficult journey and the trials they have undergone, fall prey to fear or weariness and let the dynamism which is a mark of every Christian vocation grow weak. It can also happen that institutions, because of routine or the deficiencies of their members, are not sufficiently at the service of the Gospel message. Because of this, the Church needs the witness of your hope and your zeal in order to fulfil her mission better. After finishing his talk, the pope kneels down for a few moments of prayer in the midst of the brothers. All sing “Laudate omnes gentes, laudate Dominum” (“Praise the Lord, all nations”). While the young people keep singing in the church and the tents, the pope goes downstairs into a nearby room to meet with the brothers. After greeting them one by one, he addresses the community. Then the pope leaves the community a written message that Brother Roger later placed in the Sources of Taizé, the book that sums up the essential intuitions of the community’s life. 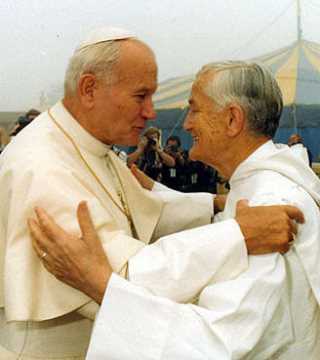 Dear Brothers, in the family-like intimacy of this brief meeting, I would like to express to you my affection and my trust with these simple words with which Pope John XXIII who loved you so much greeted Brother Roger one day: "Ah, Taizé, that little springtime!" My desire is that the Lord may keep you like a springtime that blossoms and that He keep you little, in the joy of the Gospel and the transparency of brotherly love. Each of you came here to live in the mercy of God and the community of his brothers. In consecrating your whole being to Christ for love of him, you have found both of these. But in addition, although you did not look for it, you have seen young people from everywhere come to you by the thousands, attracted by your prayer and your community life. How can we not think that these young people are the gift and the means that the Lord gives you to stimulate you to remain together, in the joy and the freshness of your gift, as a springtime for all who are searching for true life? Throughout your days, work, rest, prayer, everything is enlivened by the Word of God that takes hold of you, that keeps you little, in other words children of the heavenly Father, brothers and servants of all in the joy of the Beatitudes. I do not forget that in its unique, original and in a certain sense provisional vocation, your community can awaken astonishment and encounter incomprehension and suspicion. But because of your passion for the reconciliation of all Christians in a full communion, because of your love for the Church, you will be able to continue, I am sure, to be open to the will of the Lord. By listening to the criticisms or suggestions of Christians of different Churches and Christian communities and keeping what is good, by remaining in dialogue with all but not hesitating to express your expectations and your projects, you will not disappoint the young, and you will be instrumental in making sure that the effort desired by Christ to recover the visible unity of his Body in the full communion of one same faith never slackens. You know how much I personally consider ecumenism a necessity incumbent upon me, a pastoral priority in my ministry for which I count on your prayer. By desiring to be yourselves a "parable of community", you will help all whom you meet to be faithful to their denominational ties, the fruit of their education and their choice in conscience, but also to enter more and more deeply into the mystery of communion that the Church is in God’s plan. By his Gift to his Church, Christ liberates in every Christian forces of love and gives them a universal heart to be creators of justice and peace, able to unite to their contemplation a struggle along the lines of the Gospel for the integral liberation of human beings, of every human being and of the entire human being. Dear Brothers, I thank you for having invited me and thus having given me the opportunity to return to Taizé. May the Lord bless you and keep you in his peace and his love! It is time to go. John Paul II walks out, approaches his car, then suddenly decides to return to the church to greet the young people one last time. “I have to confess to you that I am leaving,” he tells them. “And with sadness. But the pope must obey! He has many superiors!” A peal of laughter rings out, quickly followed by applause, and the singing begins once again as the pope sets off.